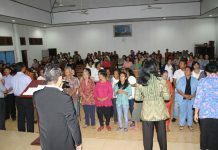 The service was started at 4.30 PM, where the worship leader invited the congregations to praise and worship God. All of them praised and worshiped God earnestly. 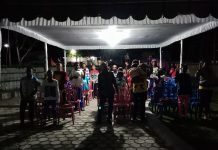 Continued with airing a healing testimony film of a woman whom God healed from the pain of liming bone at the Pray for Palu. Furthermore, the Word of God was delivered by Rev. Andreas Tarigan, from KPPI Team, taken from Mark 4:35-40. The servant of God told the story of Lord Jesus’ disciples who were on the boat and were scared when a big storm came. They forgot that there was the Lord Jesus on that boat with them. It is said that we often fear of the problems we face and wonder to God why He does not care. From this Word of God we can see that God is very good, He is with us in times of trouble. Just exclaim to the Lord, then He will release us from all our problems. The God’s servant said that the congregations must have faith in God and do not hesitate and doubt, for God will help. 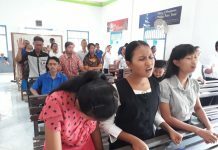 Then God’s servant invited them to believe in the Lord Jesus, some wanted to believe in Jesus as Lord and personal Savior. Thank God! In that evening, all the congregations and God’s servants rejoiced at God’s visit. Blessed be the Lord who has revealed His love and power. All praises, honor, and glory to God forever!